Grant McCann has challenged his Doncaster Rovers to respond to their latest defeat even more emphatically than they did the only other time they lost in the league this season. 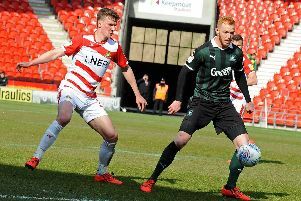 Rovers’ four match wining run and seven game undefeated streak in the league was brought to an end with a 1-0 defeat at Accrington Stanley on Tuesday night. After losing by the same scoreline at Burton Albion in August, Rovers began that unbeaten run with three draws, including stalemates with then-unbeaten sides Peterborough United and Portsmouth. But McCann wants an even better reaction from his side this time around, starting on Saturday against Fleetwood Town at the Keepmoat. “We responded after Burton Albion with three draws and four wins,” he said. “We want to respond even better than that now. “They gave every inch of themselves on Tuesday night and the travelling fans could see that they put a tremendous shift in. McCann made one change to his side for Tuesday night's defeat, recalling Ben Whiteman who was suspended for last weekend’s excellent 3-2 win at Plymouth Argyle. And the Rovers boss says he has no regrets over not making further changes to his side. “I was tempted to make changes, of course,” he said. “But the team deserved to play again. “Was that the reason we lost? No. Saturday’s visitors Fleetwood have have not won in their last six matches but McCann is expecting a tough test from Joey Barton’s side. “They are all tough games,” he said. “Every team in this division has players that can hurt you. “I saw Fleetwood earlier in the season against Scunthorpe and they were excellent that day. I think they scored five. “We’ll make sure again that we recover properly and get ready for it.